If you directly influence the creation of cyberpunk, The Matrix, the term cyberspace, and popularising the term ICE, does that mean you get a pass on influencing dubstep? Case is your average run-of-the-mill washed-up loser. On his way to drug addled death after his hacking career is cut short, he is recruited to perform the ultimate hack. Patched back together with new organs, he joins a team recruited to help an AI. 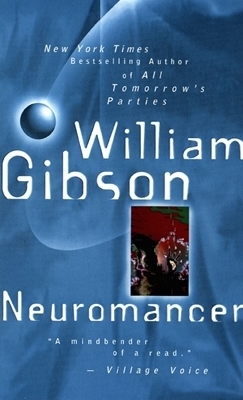 I feel like I’m being unfair in my rating for Neuromancer. This is one of those classic novels that deserves the praise it receives. The influence this novel has had on science fiction, particularly upon film, is hard to overstate. It is also easy to underestimate the skill of Gibson’s writing. For example, just before starting Neuromancer I tried (and failed) to read a sci-fi novel with a similar level of world building and interesting ideas. Where that novel failed in being able to make the jargon feel natural, and the explanations flow, Gibson succeeds. His narrative isn’t bogged down by the world building the way many others can be. Having said that, Neuromancer didn’t grab me. It was entertaining enough to keep me reading, but not enough to have me rating it higher. I’d imagine that had I read this novel 20-30 years earlier my opinion would be different. It is the curse of being the original that everyone copies. At some point people like myself won’t be wowed because they’ve seen it all before by the time they read the progenitor. I think in my review for The Executioner (Bolan pulp novel that is hugely influential to modern thrillers like Jack Reacher, Joe Hunter, et al.) I talked about this same problem. The influential novels become the trope at some point. Next Next post: Best Adaptations of All Time?